​Dr. 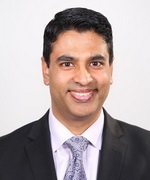 Sudeep Pramanik is a board certified ophthalmologist and Fellow in the American College of Surgeons specializing in cornea and external disease. He completed his internship at Virginia Mason Medical Center in Seattle, Washington. His residency and fellowship of cornea and external disease was completed at the University of Iowa in Iowa City, Iowa. He also completed an MBA at Rice University's Jones School of Management, graduating among the top of his class as a Jones Scholar. As an Associate Professor at Johns Hopkins Wilmer Eye Institute, Dr. Pramanik teaches routine and complex cataract surgery techniques to residents. He also teaches management of corneal disease, corneal surgery, and refractive surgery to residents. Currently, he is working on a database to track improvement in safety and outcomes in their teaching program. Dr. Pramanik is passionate about helping fight blindness. He has been to India numerous times to teach courses at the Aravind Eye Hospital, the Vittala International Institute of Ophthalmology in Bangalore, and the Disha Eye Hospital in Barrackpore. Inspired by their desire to teach new techniques to surgeons overseas, Dr. Pramanik and colleagues from Hopkins founded the International Cornea Foundation. They have developed a model of continuity of training with surgeons in India. Unlike other programs that visit an area once, the ICF supports its local surgeons for years, enabling them to adopt new technology in cataract surgery and eye banking. Started in India, the model is now expanding to Africa in conjunction with our friend, Dr. Fasika Woreta, an Assistant Professor at the Wilmer Eye Institute and Bloomberg School of Public Health. To learn more about supporting the educational and research projects of the ICF, click here. Dr. Pramanik is married to York County's Oncologist of the Year, Dr. Reena Pramanik. They live with her parents and their three boys. They used to have hobbies, but now spend their free time chauffeuring the kids to swimming, karate and scouts. 2004 American Academy of Ophthalmology: "Extended long-term outcomes of penetrating keratoplasty for keratoconus"
2006 Association for Research in Vision and Ophthalmology Meeting: Evaluation of Changes in Intraocular Pressure and Incidence of Glaucoma in Following Endothelial Keratoplasty. 2012 American Academy of Ophthalmology. "A Multicenter Study of the Incidence of Descemet Stripping Endothelial Keratoplasty Rejection." 2015 World Cornea Congress VII. "A Multicenter Study of the Incidence of Endothelial Keratoplasty Rejection." 2015 Cornea Society Fall Educational Symposium, Las Vegas, NV. "Time between Tissue Preparation and Use on Endothelial Cell Viability in Endothelial Keratoplasty." 2016 Maryland Society of Eye Physicians, Baltimore, MD. "Corneal Transplant Surgery Techniques and Indications." 2016 Maryland Society of Eye Physicians, Baltimore, MD. "Simple Versus Complex Cataract Surgery." 2016 Cornea Society Fall Educational Symposium. 2017 American Society of Catarct and Refractive Surgeons, Los Angeles, CA. "Effect of Cold-Storage Time on Endothelial Cell Viability and Pre-Stripped DMEK Corneal Donor Graft Tissue." 2017 American Society of Cataract and Refractive Surgeons, Los Angeles, CA. "Long-Term Visual Outcomes of Superficial Keratectomy with Diamond Burr Polishing for Anterior Basement Membrane Dystrophy and recurrent Erosion Syndrome." 2017 Maryland Society of Eye Physicians, Baltimore, MD. "Amniotic Membrane in Ocular Surface Reconstruction." 2017 American Academy of OPhthalmology, New Orleans, LA. "Instruction Course in Advanced Techniques in Endothelial Keratoplasty." S Pramanik, JE Sutphin, AA Farjo. “Ultra long-term outcomes of penetrating keratoplasty for keratoconus.” Presented at the Paton Society Meeting, Oct 2004, New Orleans, LA, paper submitted to Ophthalmology. Davis TC, Holcombe RF, Berkel HJ, Pramanik S, Divers SG. “Informed consent for clinical trials: a comparative study of standard versus simplified forms.” Journal of the National Cancer Institute. 1998 May 6;90(9):668-74. Zurawin RK and S Pramanik. “Endometrial balloon ablation as a therapy for intractable uterine bleeding in an adolescent.” Journal of Pediatric and Adolescent Gynecology. Aug 2001, 14:119-21. Rodgers PA, S Pramanik, PA Dennery and DK Stevenson. “Effects of starvation on hepatic heme oxygenase in adult rats.” Journal of Investigative Medicine. Jan 1996, 44: 145A. Lass JH, Benetz BA, Verdier DD, Szczotka-Flynn LB, Ayala AR, Liang W, Aldave AJ, Dunn SP, McCall T, Mian SI, Vavarro LC, Patel SV, Pramanik S, Rosenwasser GO, Ross KW, Terry MA, Kollman C, Gal RL, Beck RW; Cornea Preservation Time Study: A Randomized Clinical Trial. JAMA Ophthalmol. 2017 Nov 10. doi:10.1001/jamaophthalmol.2017.4970. Wandling GR, Parikh M, Robinson C, Pramanik S, Goins KM, Sutphin JE, Alward WL, Greenlee EC, Kwon YC, Wagoner MD. "Escalation of glaucoma therapy after deep lamellar endothelial keratoplasty." Cornea, 2010 Sep;29(9):991-5. Pramanik S, Musch DE, Sutphin JE, Farjo AA. "Extended long-term outcomes of penetrating keratoplasty for keratoconus." Ophthalmology. 2006, Sep;113(9):1633-8. Epub 2006 Jul 7.